Sheffield's students born between 1/9/2007 and 31/08/2008 will be busy with parents applying for their secondary school places in the count down to the deadline of 31st October 2018 for paper applications and 18th October for online. In preparations for which families will be attending open evenings across Sheffield's secondary schools, where many hope to gain a place at one of Sheffield's top ranked schools, which given the high demand not even in catchment area children are assured a place. So students and their parents will have been scouring various Sheffield secondary schools performance league tables in making their application choices. 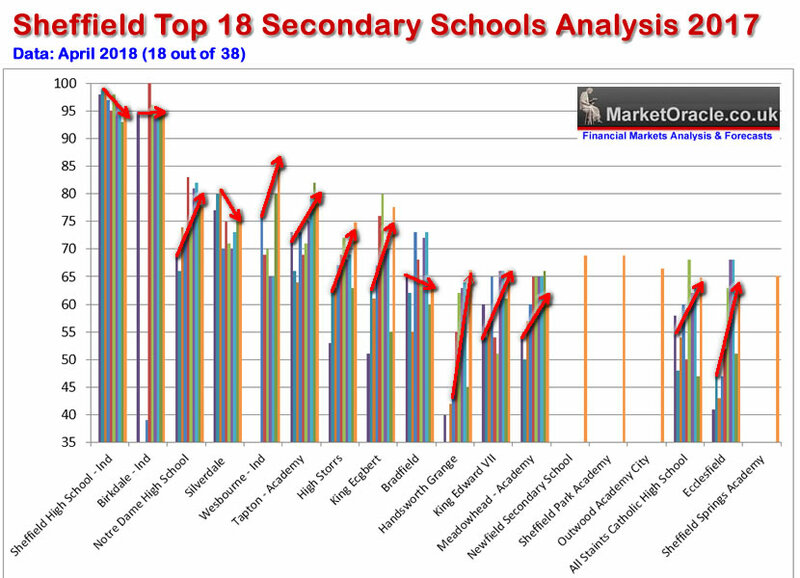 However, the league tables can from time to time prove highly misleading as many of Sheffield's 38 or so Secondary schools / Academies for whatever reasons tend to exhibit volatility in performance from year to year. Therefore a currently high ranking school may not mean that the same level of performance will continue in subsequent years as it may have been subject to special measures, therefore a better methodology in the ranking of schools is to evaluate performance in terms of trend. 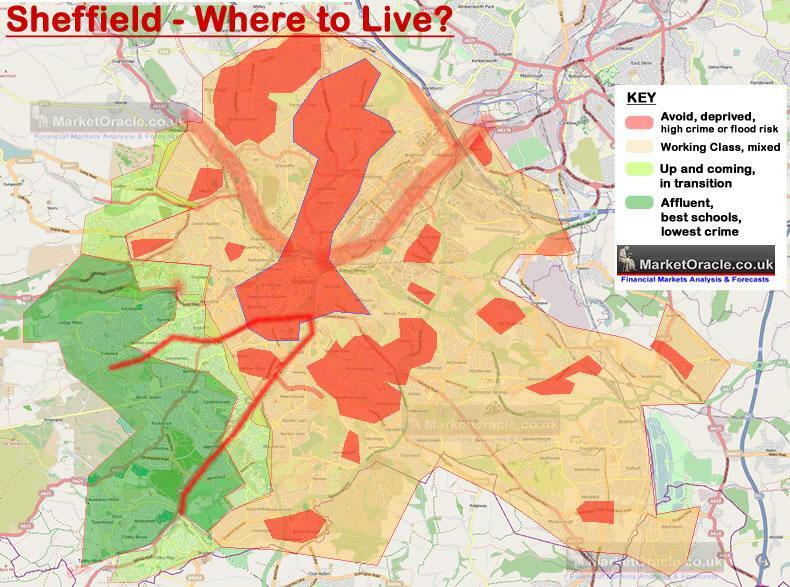 The following housing market centric map illustrates schools in which areas are likely to be heavily oversubscribed as they tend to be situated in affluent areas of the city, where even in catchment area children are not guaranteed a school place due to rampant fraud in school place applications. 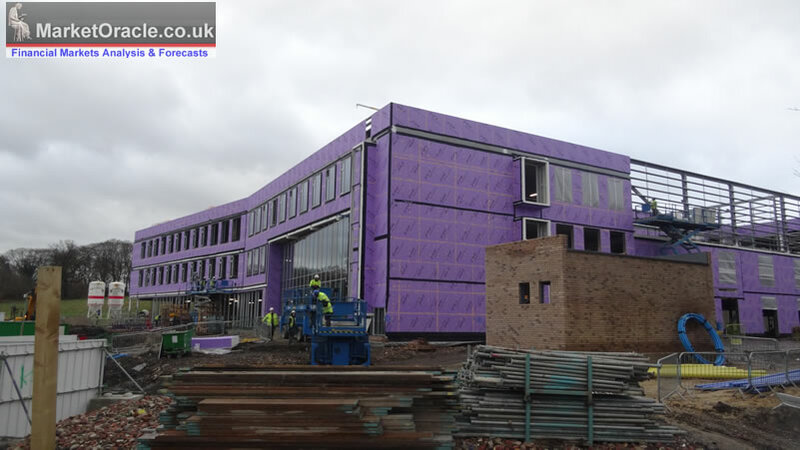 Developments overt the past couple of years have included explanation of Sheffield's best secondary school, Silverdale by 60 places or about 30% for several years until the new secondary school situated on Carterknowle Rd was built. Whilst a whole host of existing infants and junior schools have or are undergoing expansion such as Ecclesall Infant School and Dobcroft Juniors that parents and teachers had desperately fought to prevent the expansion of. Against this we have ivory tower academics periodically producing studies that the mainstream press eagerly regurgitate that literally state that affluent parents tend to hog places at Sheffield's best schools, studies that are clearly devoid of commonsense to realise that it is the affluent parents who are responsible for the existence of the good state schools in the first place, for if it were a question of funding then the school league tables would be in reverse order as on average affluent schools tend to receive about 30% less per pupil than the schools in less affluent areas. Instead what academics recommend is a recipe for disaster, one of of turning ALL of Sheffield schools into bottom ranking schools, ALL under performing, forcing affluent parents to ultimately take the leap into private schooling, leaving behind literally a city wide waste of schools that no parents want to send their children to! 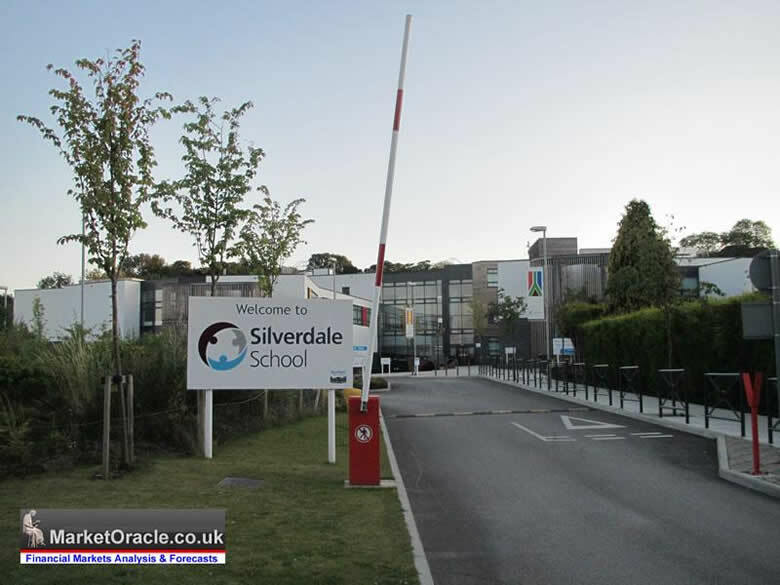 Furthermore even Sheffield's best school, Silverdale is no longer immune to making it into the mainstream press for all the bad reasons as the Daily Mail recent report of a gang of Somalian girls attacking a white girl because she posted something on a social network about their area. A school has come under fire after a girl gang allegedly attacked two teenagers within a fortnight, leaving one with broken ribs. Mother Natasha Green claims her daughter Leah, 16, was a victim of racial bullying by a group of Somalian girls, who took issue with Leah spending the day in a Somalian part of town. She claims her daughter was set upon by the girl gang in the school canteen after a row broke out over a Snapchat post showing the day out she'd had. Parents desperate to avoid having their child enrol at under performing catchment schools just intensify the epidemic of fraudulent school place applications as many parents are more than willing to have their children avoid going to the local catchment area school. Especially as this fraud has NO consequences in law and is seen by the perpetuators as a victimless crime, where as the inept system currently stands that even if the fraud is subsequently discovered once the child starts school, then the child would still be allowed to continue at that school which effectively amounts to fraud being rewarded rather than punished, that's what happens in socialist Sheffield. Therefore many parents will be pressurising family members, friends, acquaintances or even using addresses without householders knowledge, or deploying other tricks of the trade, all in pursuit of a place at one of Sheffield's best ranked state secondary, juniors and infants schools. The bottom line is that Sheffield's school places crisis is easing as existing schools are expanded and new schools are built, but in parents quest to send their children to Sheffield's best state schools then it could be as long as a decade before they have a serious impact on the heavy demand for places at Sheffield's best schools, as it could take that long for new schools to show any consistently of results in the league tables.